If you wish to be close to the ocean... want a clean, comfortable, Brand New house with all the bells and is the place for you! Welcome to the "Tide Pool"! The meandering path to the beach is right next to the "Tide Pool". Literally a 3 minute walk. This is the house that makes us say "WOW!" This is the quintessential beach get-away with King beds and flat screen TV's in every bedroom, bunk beds next to upstairs master bedroom, Jacuzzi tub in the master bathroom, state of the art appliances, granite throughout, custom kitchen, game room and New Everything! Wheather you are in the living room, at the dining table or on the deck, you won't miss a migrating whale, or the perfect wave ridden by a ocean is on display for you! As you enter, the floor plan is light and open with a wall of windows facing the ocean. Let the sunsets come to you! The entry level has a state-of-the art kitchen, large dining and living rooms with 2 bedrooms, 3 baths and huge wrap around deck with Hot Tub. The living room has Westerly facing sliding glass you love the ocean this is the house for you. Perfect Views! The kitchen has a great wrap-around seating for groups that love to hang out and catch up with each other! The upstairs has the master bedroom and master bath with jacuzzi tub, a balcony and comfy sofa sleeper. Go into the garage (detached from house) and enter into the game room! Pool Table, Ping Pong, Air Hockey and Foosball table! ENJOY! We had a terrific time with our kids and grand-kids (ages 2-8). Close enough to the beach that we could easily get to the sand, but not so close that we worried about a toddler sneaking out and getting to the water alone. The large open family room area was great for congregating - we could easily see the little kids from the kitchen & dining table. The BBQ grill is large enough to accommodate a lot of food. The kitchen is well stocked with plates, glasses, pans, paper towels, etc. The playroom equipment is a little battered, but it was still fun. The toddler play kitchen was a big hit with our gang!! Bring your own hairdryer if you need one. Manager response on 2018-10-31 - Response from Dillon Beach Property Management, Inc.
Great house, amazing location, very spacious, well-equipped, and comfortable. Had a great time! The house is so nice and the game room was popular with the kids. Hope we can stay here again!! Best location in dillion beach. It was amazing. Exactly as described. Looking forward to when I can do it again. Manager response on 2018-09-19 - Response from Dillon Beach Property Management, Inc. Manager response on 2018-07-22 - Response from Dillon Beach Property Management, Inc. The proximity to the trail to the beach is good, but creates a lot of foot traffic. Not terribly private, and hot tub has no "privacy" either. Wish the deck were enclosed so children (and pets) could be out there. All guests complained their beds were hard and uncomfortable; probably time to replace the mattresses. Kitchen was GREAT the radiant floor heat amazing too.Number of bathrooms and how beautiful they were was certainly a plus. Manager response on 2018-10-02 - Response from Dillon Beach Property Management, Inc.
We had so much fun! Great location and plenty of space. Manager response on 2017-04-22 - Response from Dillon Beach Property Management, Inc. Manager response on 2017-07-24 - Response from Dillon Beach Property Management, Inc.
Every October we have rented this home for a family vacation. The location to the beach is perfect... the sunsets are amazing and to put it simply every year when we walk through the doors it feels like we are returning to our own home! Over the years; we have lost family pets that have come to Dillon with us and added grandchildren and even had a proposal on the deck this year! Tide Pool and Dillon Beach will always hold a very special place in our families heart! It's perfect! Manager response on 2017-10-26 - Response from Dillon Beach Property Management, Inc. The view and setup of the house was amazing! Location was perfect! The house was not very clean. Most dishes had to be rewashed once taken out of the cabinets. We loved how close the house was to the beach and how well everything was taken care of! Manager response on 2018-03-27 - Response from Dillon Beach Property Management, Inc.
We had a terrific time. Lovely setting. The house worked very well for our group. The weather cooperated. I highly recommend this vacation rental. All in all, a memorable time was had by one and all. This view was spectacular, just what we had hoped for. The bedroom arrangement was excellent. Kitchen was well stocked with equipment. Only a couple of small issues, no pot holders and a faucet that didn't work well. Manager response on 2015-02-23 - Response from Dillon Beach Property Management, Inc.
wonderful stay during spring break. watch out for the ants. cannot beat the location or the view!!! Manager response on 2015-03-29 - Response from Dillon Beach Property Management, Inc. Tide Pool is a beautiful, spacious house right on the bluff overlooking the long golden sands of Dillon Beach. We were two couple and a dog, and there was still plenty of room in the house. The house is very well maintained and the wrap round view of the beach is stunning. A very short walk (less than 5 'ins) down the convenient path to the side of the house takes you right to the sand. Dillon Beach and Tide Pool are both dog friendly. The property management company were extremely helpful and very organised. They made our entire stay very easy and relaxing. Tide Pool is a great house for a couple or larger group looking to relax and soak up all the natural beauty of Dillon Beach and its coastline. I would definitely stay here again! Manager response on 2015-05-20 - Response from Dillon Beach Property Management, Inc. This vacation home is in the perfect location. Just steps to the beach, with beautiful views. Listen to the waves sing all night long. Called for one bit of help, and Dale was there right away. The views of the ocean were stunning, the stars were outstanding! 45 minutes takes you from the sea, to the redwoods, to Sonoma Country, to Lagunitas Tap Room, to fantastic restaurants, and of course, small town festivals! Always returning to peace and serenity at Tide Pool. Manager response on 2015-04-22 - Response from Dillon Beach Property Management, Inc.
A perfect Dillon Beach vacation! Tide Pool is perfect in every way! Manager response on 2015-08-23 - Response from Dillon Beach Property Management, Inc. The House was ready for us when we arrived. The view from the front room and porch is spectacular, and the trail to the beach was literally straight in front of the deck. Kitchen was great and fully stocked. Game room is a bonus, and although it needs some repairs, it was a great retreat for the kids. Manager response on 2015-06-11 - Response from Dillon Beach Property Management, Inc.
First of all I want to give Dillon Beach Property Management a big thumbs up for the service they provide! It was a pleasure to deal with them in setting up our vacation rental. The home itself is well appointed and very clean. The location is unbeatable with a direct ocean view and a trail down to the beach. A restaurant is within walking distance as well. Most of the shopping and more restaurants are located in Bodega Bay, which is approximately 30 minutes away but with a home like this we didn't have the urge to leave the property for too long. There is a ping pong table, air hockey table and pool table in the garage and a hot tub on the deck. The ping pong paddles could use replacing and the air hockey table is probably on its last legs but that is the extent of my suggestions for improvement. Manager response on 2015-11-25 - Response from Dillon Beach Property Management, Inc.
Beautiful home in a beautiful location. My family and dog had a great time going to the beach every day which is just steps from the house. I would highly recommend this place! Manager response on 2015-07-04 - Response from Dillon Beach Property Management, Inc. The house was amazing and the location perfect. The property management company was very helpful when we needed to get the propane filled for the grill. The only negative issue is that all the beds need an upgrade. The mattresses were hard and pretty uncomfortable. Other than that, we all had a great time and would love to come back next year. Manager response on 2016-08-02 - Response from Dillon Beach Property Management, Inc. This is a very nice, clean vacation rental. It's dog friendly which is key for us - our animals are all under solid voice command and well trained. It appears other renters have also solid pets because the place is immaculate. Very nice to know other pet owners are also responsible. The path to the beach is a fun adventure, scrambling down the ravine and over the rocks. It's a perfect way to start the beach walk and gives you that last little challenge to get back home after a time at the shore. Dillon beach is great for swimming too which makes the walk to the beach even more valuable. The view out the front bay windows is stunning... at all times of the day though the sunrises and sunsets are the most appealing - totally picture worthy! Manager response on 2016-09-12 - Response from Dillon Beach Property Management, Inc. Tide Pool was even more beautiful in person. The house was very clean and the kitchen was stocked with everything you need to cook for a family. The highlight for my family were the dolphins and whale. We watched all afternoon from the deck. The dolphins were there all week. I will not hesitate to vacation there again. Manager response on 2016-09-16 - Response from Dillon Beach Property Management, Inc.
Home was clean, new and perfect for our family. Hot tub, ocean view, short walk to a huge dog friendly beach and the master bedroom also had a room next to it for our granddaughter. The garage was filled with a pool table, air hockey, ping pong and poker table. Hours of fun when the fog came in. Loved our few days ! Manager response on 2016-07-17 - Response from Dillon Beach Property Management, Inc.
A fabulous location and a great house! Very well equipped. I would definitely recommend this beautiful house! Manager response on 2016-12-29 - Response from Dillon Beach Property Management, Inc.
We arrived at 3:00 promptly to check in for our stay at Tide Pool. We entered our code in to the lock box, got the key and opened the door to a beautiful very clean house! Everything about our experience was super smooth. The email/cell phone communication was great. The house was even better and exceeded our expectations, inside and out. We had a great time! We will absolutely book again! All you need to bring are towels for the hot tub, and your special oils, and spices to cook with ( the confirmation letter we received before we arrived told us this so we came prepared!) Thanks again for an awesome, memorable family experience!!!! Definitely good times!!! Manager response on 2016-11-26 - Response from Dillon Beach Property Management, Inc.
What's not to love? A beautiful luxury home with stella views and attentive staff. I took up the recommendation to use Cyndee the professional massage therapist and she melted us into peaceful bliss. A great get away from phones and any stress. Three nights were perfect. Manager response on 2016-12-21 - Response from Dillon Beach Property Management, Inc. This property exceeded all our expectations! Had a wonderful time. Manager response on 2017-03-01 - Response from Dillon Beach Property Management, Inc.
We had A great time at A great place.The location was perfect, only about A 5 min. walk to the beach.When we arrived the house was warm and music was playing. The drapes were open and it was like walking into our home.The next day I was called to see if every thing was in order, . How nice. We will be back. Manager response on 2017-02-08 - Response from Dillon Beach Property Management, Inc. Perfect in every way! If you want a modern house with incredible access to beach, then this your place. It is great for dining in and has a game room for the rainy days. We will be back for sure! Manager response on 2017-02-28 - Response from Dillon Beach Property Management, Inc. The perfect location for a perfect vacation!!!! There are many flat screen TV's and they have Directv so we were able to watch our football games!!! We only used the game room a couple times and they do have pool, ping pong and foosball but most of the tables were older and not in great condition! All in was a perfect place to celebrate my parent's 49th wedding anniversary! We had everything we needed, the house is located in a PERFECT location for our daily beach trips AND most is dog friendly! We'll definitely be back!! Manager response on 2013-10-02 - Response from Dillon Beach Property Management, Inc. Manager response on 2014-01-05 - Response from Dillon Beach Property Management, Inc. This place was absolutely wonderful! The view and walk down to the beach made me think of some novels that I've read. The house had everything we needed in great condition. The beach below is so beautiful and easy to access. There are deer that visit the neighborhood each evening. We were close to Point Reyes Seashore, Bodega Bay, and a short drive to the wine country. We would definitely rent this house again! What an incredible home, and I mean home. It felt like you walked into your own home, comfortable, great kitchen for the family feast, with a dining room table that all 10 of us could enjoy! Weather could of been better but hot tub was a treat! Absolutely a great place to stay...manager where super helpful! Do it!! Manager response on 2013-07-25 - Response from Dillon Beach Property Management, Inc.
Beautiful home and amazing views. House was new and clean. There was a few minor issues that come with a new house. We loved the master bedroom and master bath. It says it sleeps 10 but one of the beds is a pullout and is for little people. Another bed is located in a large closet area it's a air mattress, no one wanted to sleep in there it doesn't have any air flow or windows (stuffy). We put our own air mattress down stairs. If you have kids it is a ok room then. The other two bedrooms were very nice. Kitchen was nice had about everything we needed and was fun cooking. Hot tub was wonderful soaking and watching the waves roll in. Beautifull view from inside and out. You can't beat the location just hop on the trail right in front of the house and your at the beach in 2 minutes. It was perfect for our kids they wandered to the beach all the time. Tide pools are really close also. We had a great time playing in the game room pool, ping pong etc. would definitely rent again. Manager response on 2013-07-06 - Response from Dillon Beach Property Management, Inc. Wonderful home and view. Beautiful dark night sky. Loved the hot tub. Kitchen had every appliance. Easy walk down to beach. (Though not suitable for older unsteady relative.). Just remember to bring groceries! Local store was extortion--$7.50 for tub of vanilla ice cream. Bring fleece too. SF summer fog can be cold. Manager response on 2013-08-04 - Response from Dillon Beach Property Management, Inc.
Hi Leslie, Glad you had a great stay! Look forward to seeing you the groceries ...20 min in any direction from a major lots of little Mom & Pop stores around. the view and location can not be matched by any other cabin. Wonderful. Better than advertised. We especially enjoyed the trail down to the beach. Manager response on 2013-11-08 - Response from Dillon Beach Property Management, Inc.
Dillon Beach - on the beach! No better location in Dillon Beach. A beautiful, comfortable, updated house with all the amenities. The kids loved it, too. Manager response on 2013-10-15 - Response from Dillon Beach Property Management, Inc.
Great Stay at Tide Pool! My family stayed at Tide Pool for one week. It was wonderful. The game room was a big plus and the location -right next to a trail leading to ocean - was perfect. The house is gorgeous. Manager response on 2015-01-21 - Response from Dillon Beach Property Management, Inc. Fantastic house for family vacation! We rented TidePool for the 4th of Juky weekend. The house is practically brand new as we recall the house being built the last time we came to Dillon Beach. The house has an open layout downstairs, very roomy. The upstairs was also spacious with plenty of sleeping space. The "extra" room upstairs with bunks was bigger than we expected-not bad considering it's actually a walk-in closet! The kids (teens & 20s) really enjoyed the garage set up with ping pong etc. the room above will be great when completed. They spent hours playing video games and listening to their music without us being able to hear them! I loved the location and listening to the waves crashing in the evening! Manager response on 2014-07-23 - Response from Dillon Beach Property Management, Inc. Perfect for a 3-generations family holiday. Great house, close by beach. Beware that the path is a bit treacherous, but that made it fun and even our 5 year old could handle it fine. 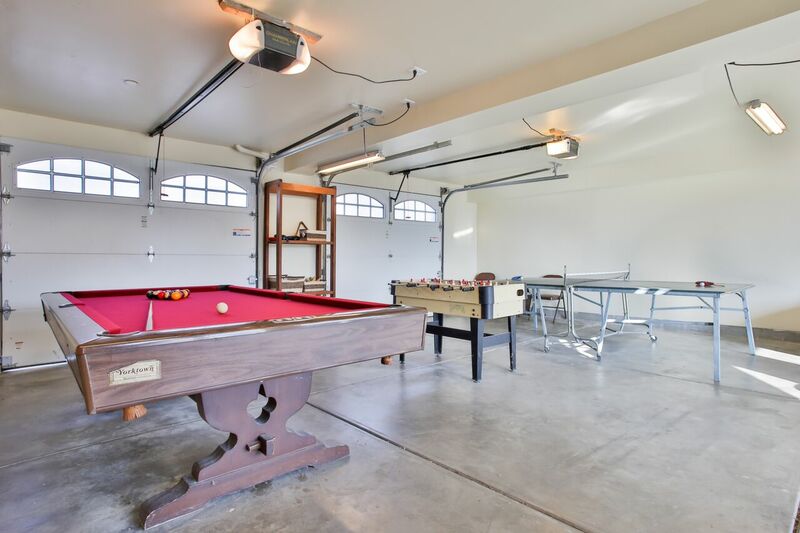 Big advantage: a double-sized garage with a pool table, ping pong, air hockey, and even a poker table. Our grandkids loved this option, particularly since the weather was chilly so all-day beaching was not an option. Also, great hot tub. These amenities plus the extraordinary beauty of Dillon Beach and a great house setup made it a terrific vacation. Another great feature was the layout of the rooms: our kids who have 5 children stayed on the top floor, with its own bathroom plus beds for everyone. on the main floor was a bedroom with bath for our son and his family (one infant) and another bedroom with its own bath for my husband and myself. Manager response on 2014-04-25 - Response from Dillon Beach Property Management, Inc.
We had a wonderful time. Easily accessible beach, beautiful home. Very family oriented. Great house in a gorgeous setting! This is our second stay at the Tide Pool. The house comfortably fit our party of 7. You cannot beat the location which gives beautiful views and easy access to the beach below. The house is stocked with everything needed to enjoy your stay. We also highly recommend the hike at the end of Oceana Drive in the neighborhood. Head out toward the ocean and follow the path along the cliffs to a beautiful private beach area. It was one of the prettiest walks we have ever done. We also enjoyed the little restaurant at Dillon Beach..the only one in town! We would definitely stay here a third time! Manager response on 2014-09-30 - Response from Dillon Beach Property Management, Inc. Very comfortable house and great for family gatherings. Kitchen was well equipped and perfect for all of the cooks in our group. We loved the deck and the view. We watched a wedding party go down the trail. The dogs were also very happy. Manager response on 2014-10-11 - Response from Dillon Beach Property Management, Inc.
We had a great time and the home has everything you could possibly need in the kitchen. My only complaint is that the house was listed to sleep 10 persons but it is good for three couples not four. One of our guests slept on what they called a pull out which was like a Futon. No privacy at all and very uncomfortable. The twin bunk beds are in a room directly off of the master bedroom upstairs so if you have children that is great for them to be near parents. The trail to the beach is adjacent to the home so it is very easy access to the beach. Manager response on 2014-08-21 - Response from Dillon Beach Property Management, Inc.
First Dillon Beach Family Vacation… With grown kids who live throughout California, as a family we decided it would be fun to set a family vacation that could continue every year at the same place! We picked Tide Pool as our location and could not have been more impressed or happy with our pick! The home is beautiful and the location is amazing! We loved the short hike to the beach, the kitchen has everything you could need and more… the design of the home is perfect… We hope to continue our new vacation tradition every year! Manager response on 2014-10-20 - Response from Dillon Beach Property Management, Inc.
What an unbelievably beautiful home, view, and close to the beach, this is by far my most favorite place! Thank you Tidepool owners for opening your lovely home to us! We will be back!